Our cookie designs start at $3 each (plain-iced shapes), individually packaged in a clear cellophane bag, and hand-tied with a coordinating ribbon. Price is dependent upon the size and details of the design. Typically, decorated cookies with details are $4 and up. Minimum order is one dozen decorated cookies of a single design. Minimum order of Grandma Nam's Classic Chocolate Chip Cookies is two dozen; $5/ half dozen. All cookies are made freshly to order... we do not keep cookies in stock. Choose a variation of a design we have already created, or work with us to create a new design you love! 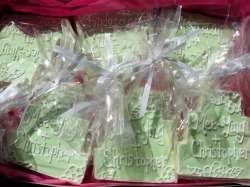 Cookies are individually wrapped and then packaged in cake boxes with tissue. 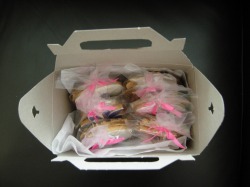 While most of our customers like their cookies individually wrapped as favours, packaging is customizable too! 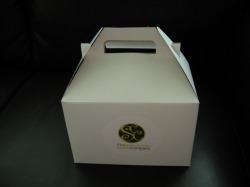 Our sleek gable boxes (see photos) are a perfect way to give a dozen cookies as a gift! Mix a half dozen of our beautiful custom cookies with a half dozen of our delectable chocolate chip cookies for a fantastic gift!